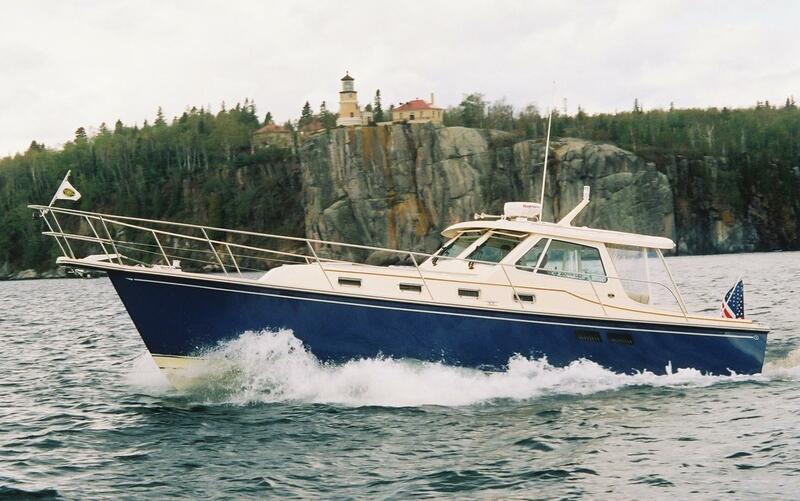 Island Packet’s heritage of design and craftsmanship is evident in the Packet Craft 360. 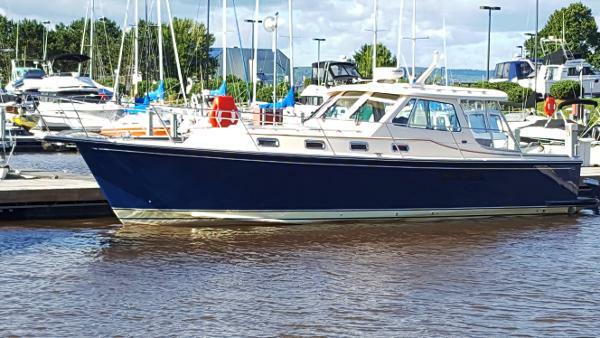 Nautier Hobbits is a fantastic Fresh Water Boat in Bristol condition, given the best of care by her loving owners. 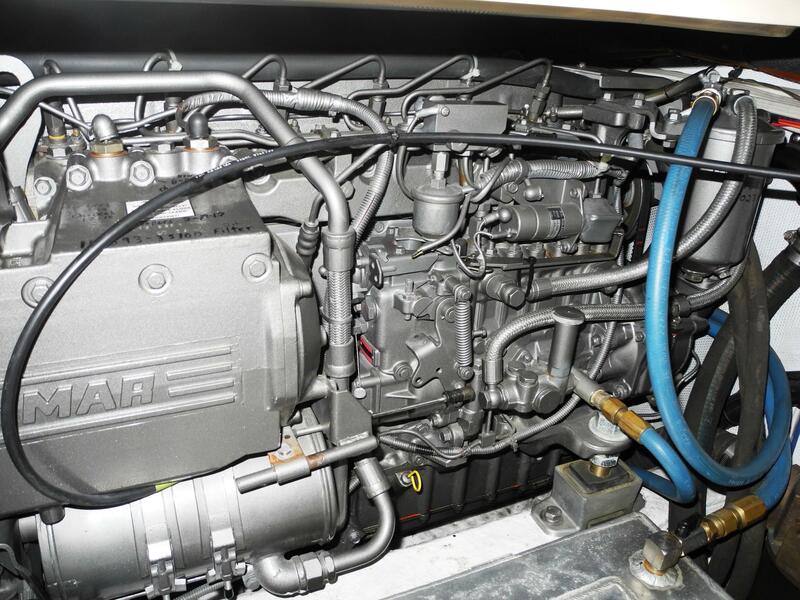 Stored in a climate controlled building more than 9 months every year, she has only 990 hours on the Yanmar Diesels. 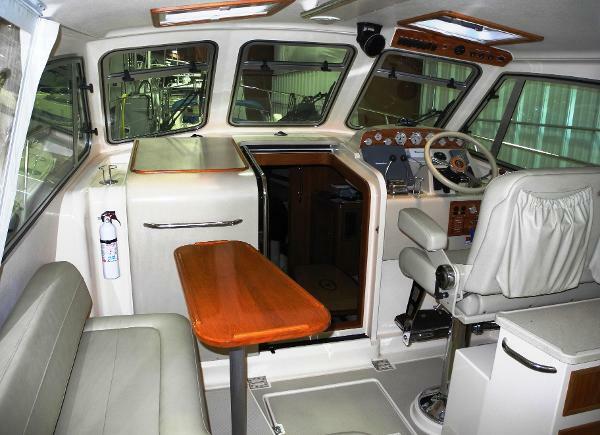 Numerous upgrades include a FreedomLift davit system and Teak and Holly Cockpit floor. 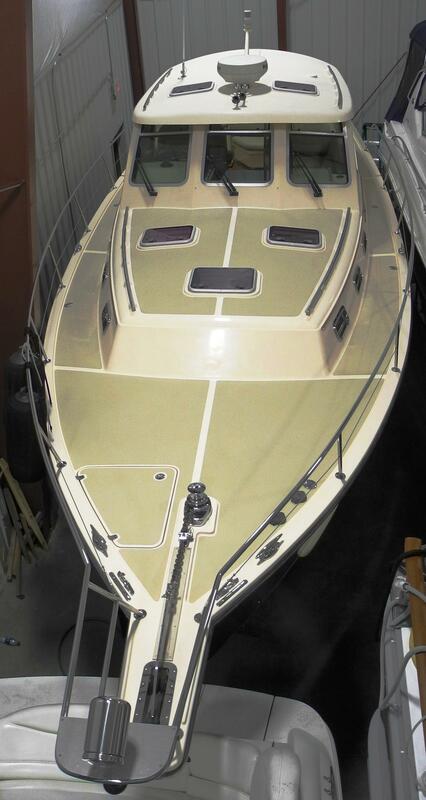 With the factory upgrades this boat can not be compared to other Packet Crafts. 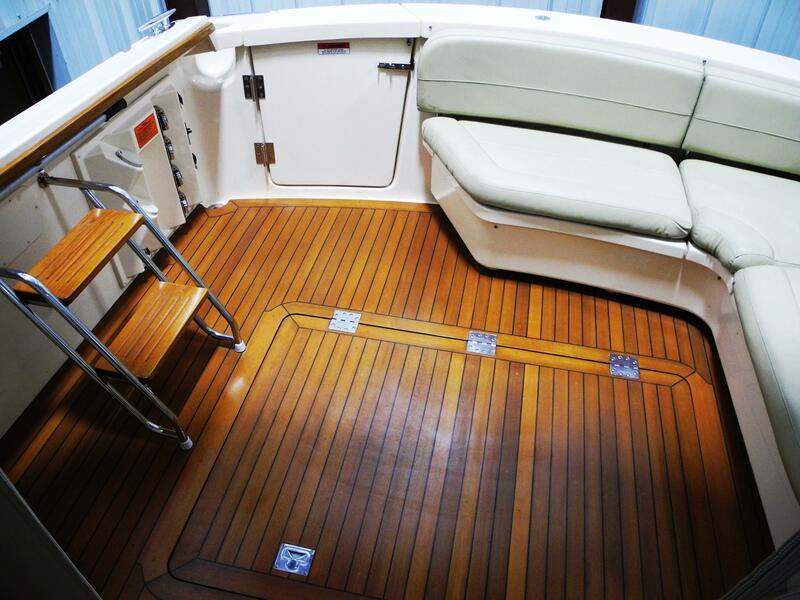 No other Packet Craft has the teak flooring on the back deck and swim platform. The cushions are an upgraded leather The table is of tiger maple. This boat was a special built to compete with the Hinckley line. This boat is a real head turner. 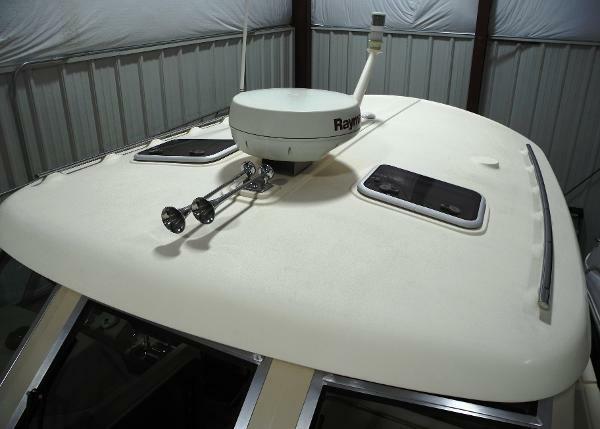 The 360's hull design has tunnels that reduce prop angle, providing a draft of only 2 feet, 8 inches. 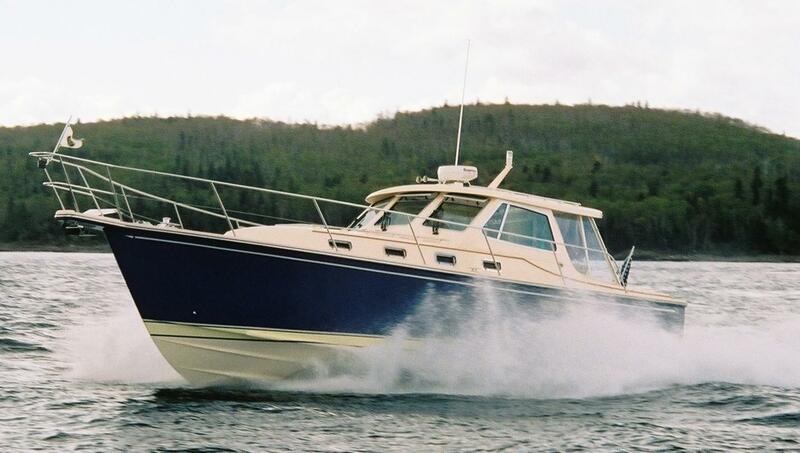 Tight turning at cruise speed produces a feeling similar to that of a smaller high-performance boat. 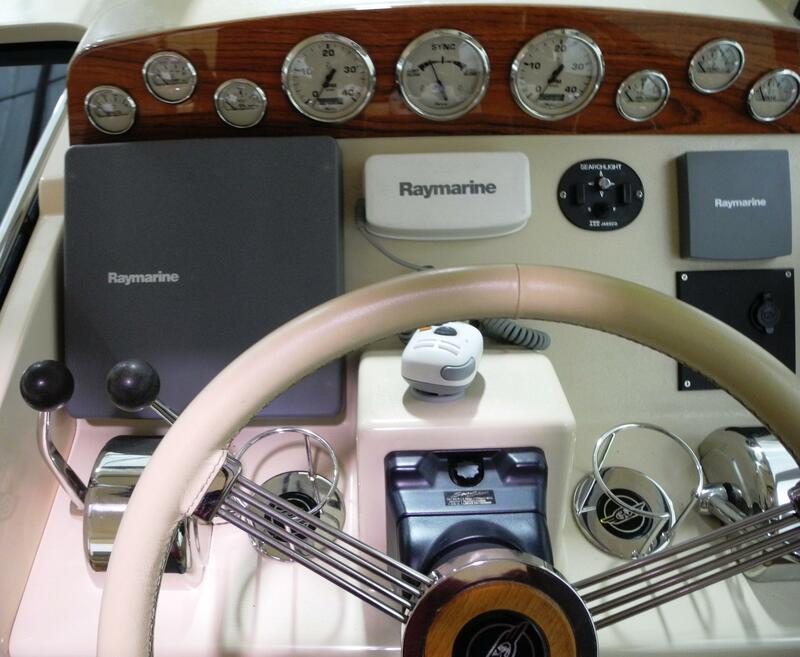 This is a sensational boat to operate! The bridge deck is well laid out for comfort, whether you're running or relaxing at anchor. 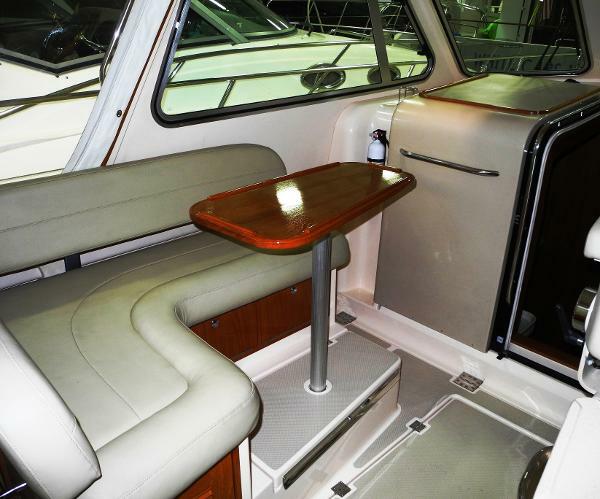 It has a fiberglass hardtop with two opening hatches. The three forward windows have opening vents on the top, as well as two opening side vent windows that provide airflow on hot days. 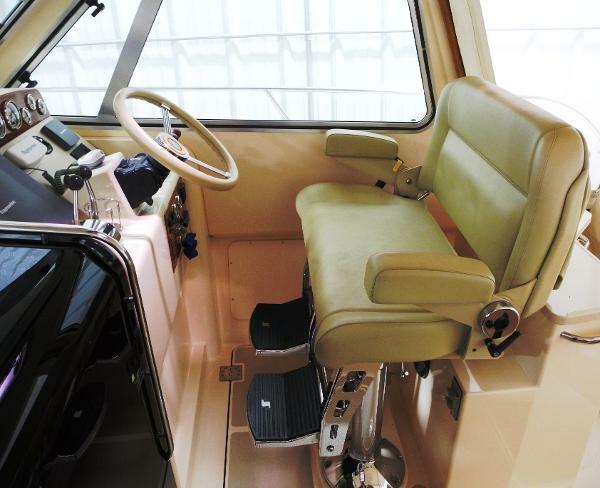 For comfort and visibility, there is a fantastic 6-way adjustable double helm seat with arm and footrests. The Dino leather-covered wheel, and the Faria instrumentation beautifully complement the durable synthetic wood-grain cluster. The controls are placed to allow for effortless reach while sitting or standing. 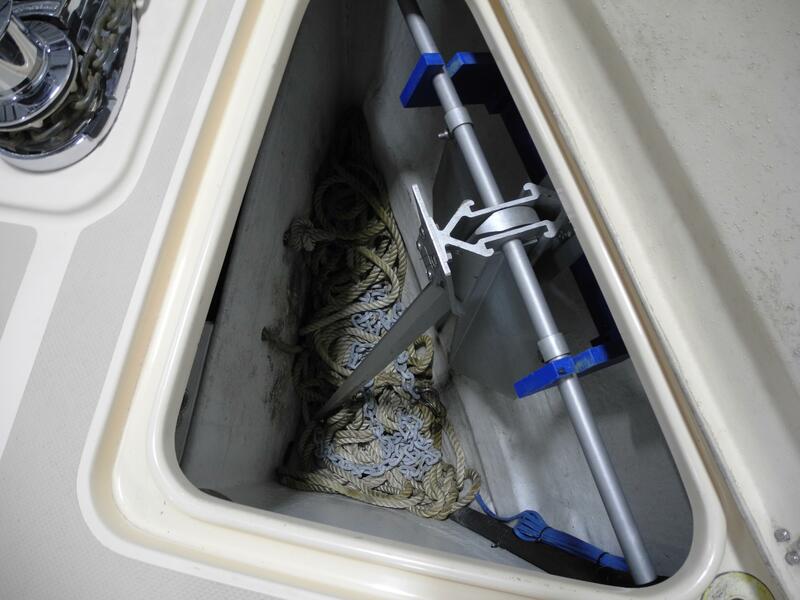 The entire helm pod is hinged at its base to ease installation and service. There is a removable three-piece drop curtain that can separate the bridge deck from the aft cockpit. Across, on the port side is an L-shaped settee with a varnished removable table and storage underneath. 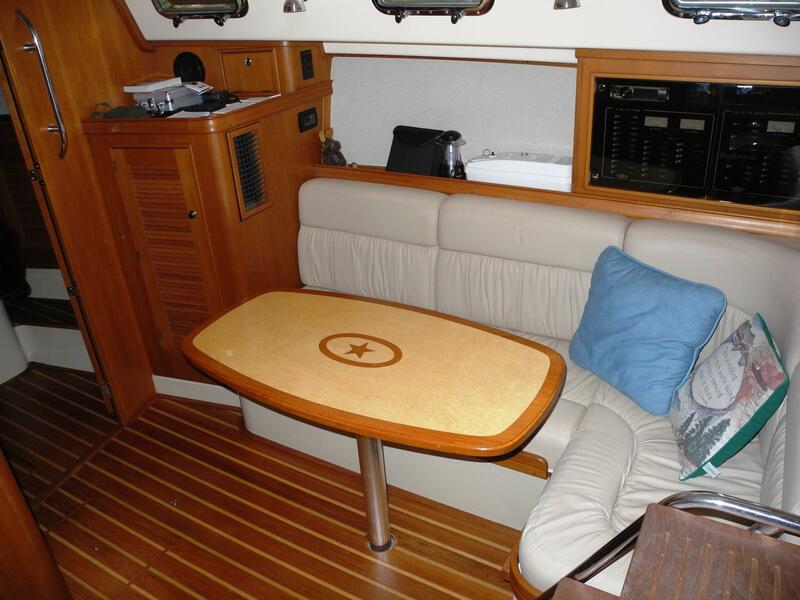 Behind the helm seat is a wet bar with a sink with hot and cold pressure water, plus additional storage areas. The aft cockpit has steps to the side decks and the optional L-settee with storage. There is also a utility alcove with shore power connections, breakers, dockside water hook-up and a hot and cold cockpit shower. 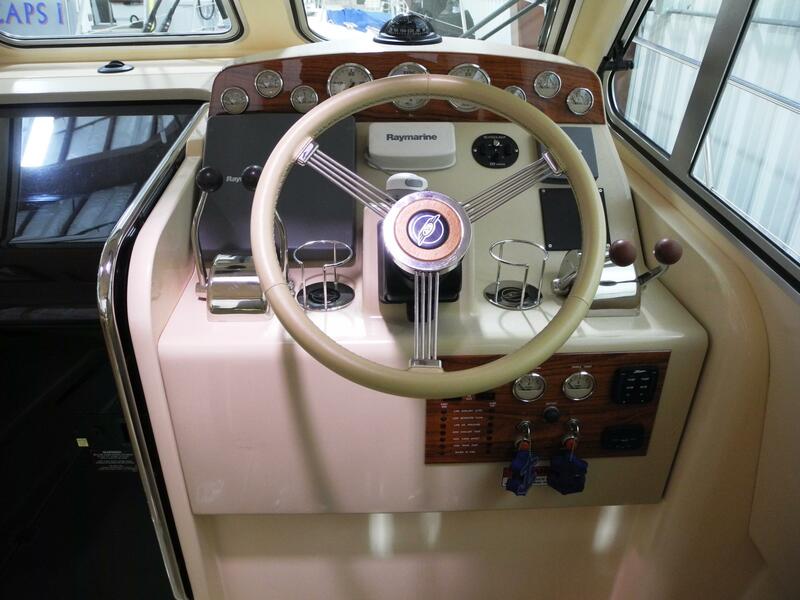 In the starboard aft corner is an inward opening transom door which leads to the swim platform. 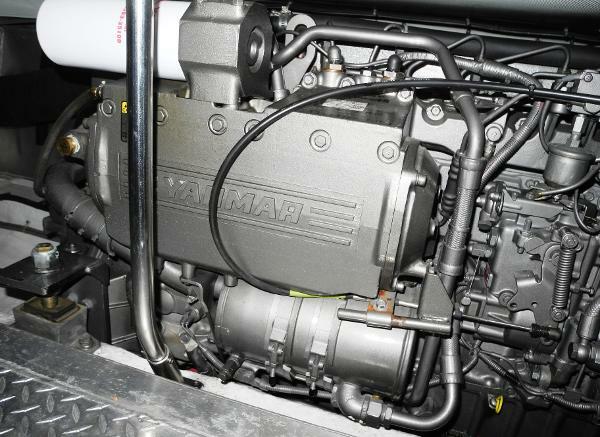 At the heart of the mechanical systems is the dependable twin Yanmar Turbo Diesels rated at 370hp with only 990 hours. 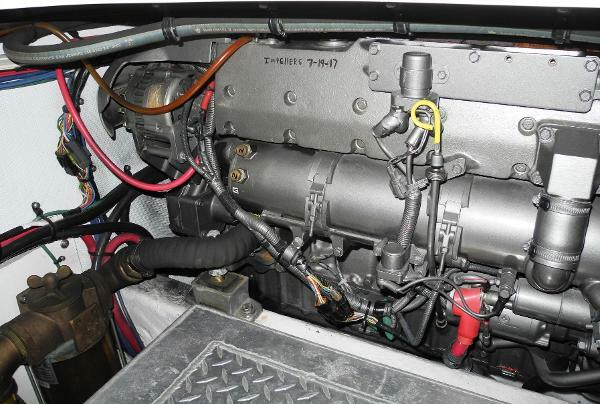 The engines are coupled to ZF Hurth transmissions for smooth operation. 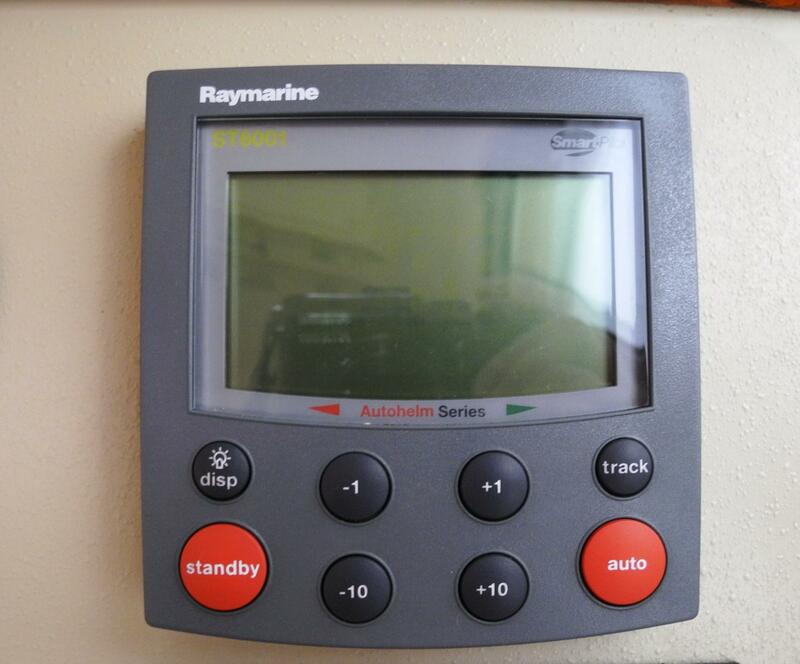 Access to the engines is provided by an electrically operated bridge deck or through the day hatch. 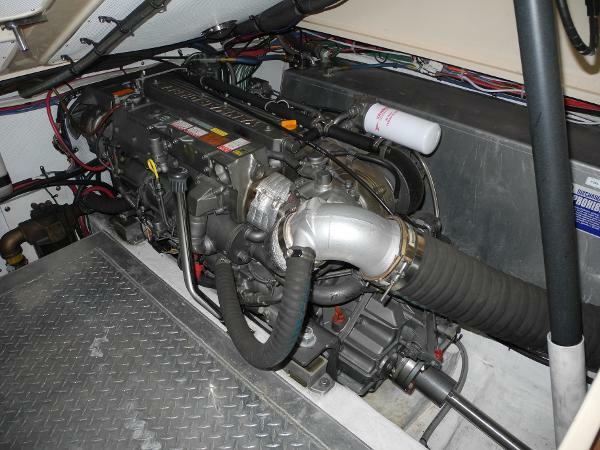 The boat has extensive sound and thermal insulation in the engine compartment and adjacent machinery spaces. 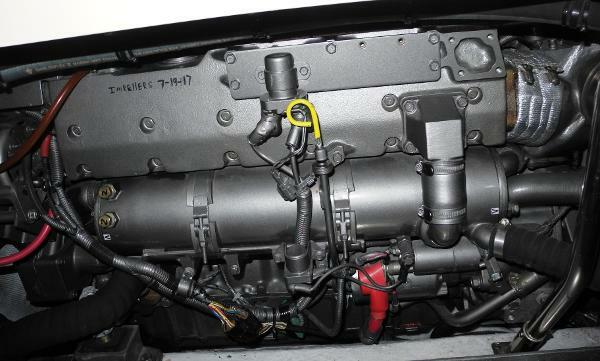 The three welded marine aluminum fuel tanks operate as a single system which can be filled from either port or starboard. 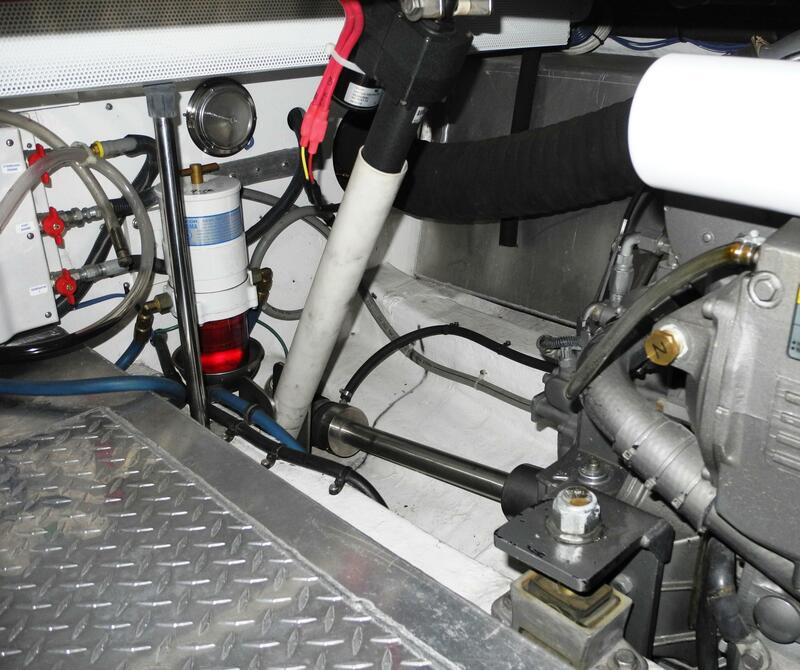 There are two 75-gallon saddle tanks and a 150-gallon centerline tank for a total of 300 gallons. 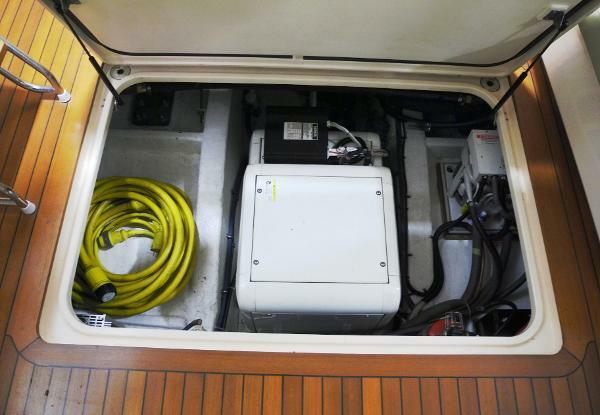 For power away from the dock, there is a Kohler 5kw generator with 250 hours on it. All the electrical wiring is marked for easy identification. 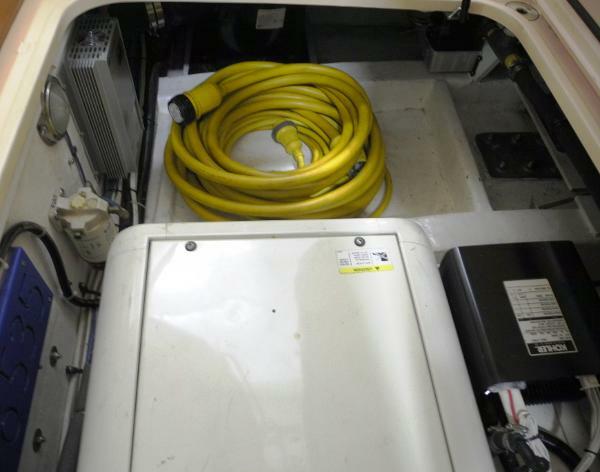 8 AGM Interstate batteries, 4 model 1400 for engine service (new April 2015), 1 AGM for the generator and 3 AGM batteries for the house bank (new April 2015). The Packet Craft has comfortable sleeping for 4. Two in the large forward cabin island berth, and two more in the main cabin. The L-shaped settee can also be made into a double berth large enough to sleep 2 adults comfortably. Cedar lined drawers and lockers throughout provide generous storage. The fully optioned galley features Corian countertops plus ample cabinetry and lockers for storage. 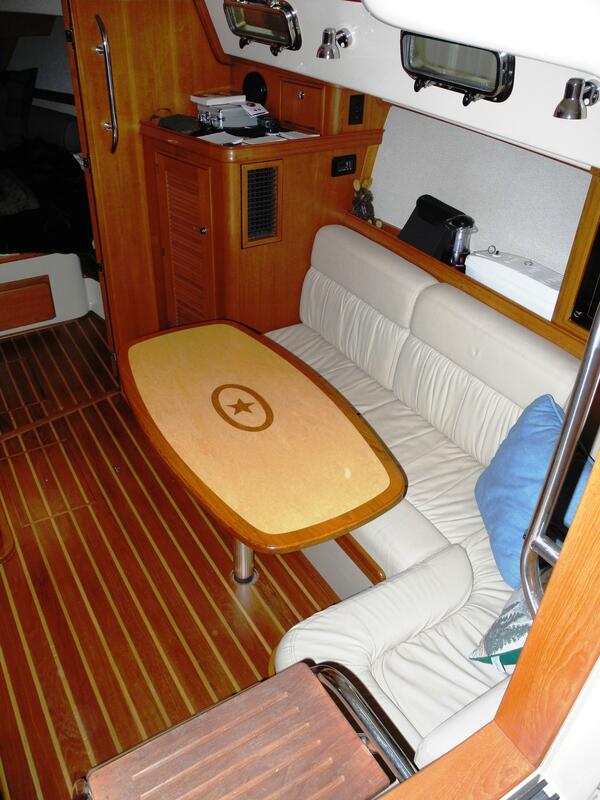 The beautiful varnished teak salon table has an inlaid Island Packet logo and can easily be removed and conveniently stowed when not needed. 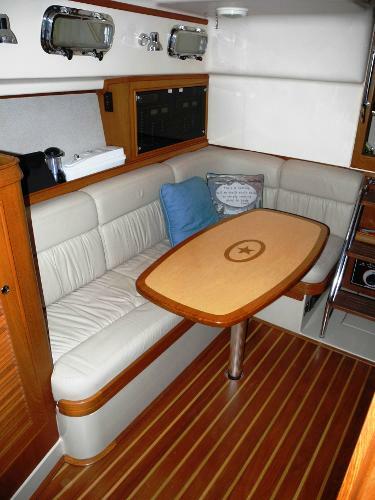 The interior decor is a tasteful blend of premium designer fabrics and surfaces combined with a solid, bevel planked teak and holly sole. Lewmar hatches with shades and screens, paired with a sliding cabin door with a screen, provide multi-directional ventilation. 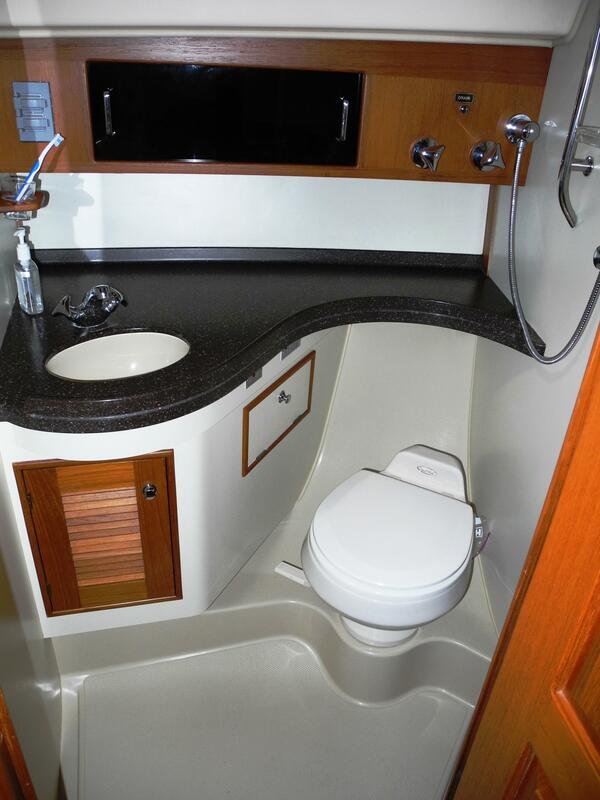 The L-shaped galley is located immediately to port as you go down the companionway. It is very functional and has great storage. 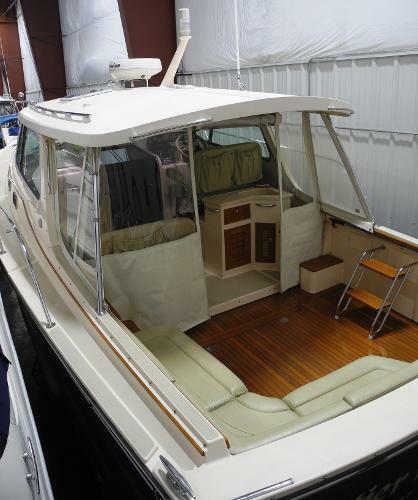 Nautier Hobbits is available to view at Barker’s Island Marina in our heated storage building. Island Packet’s heritage of design and craftsmanship is evident in the Packet Craft 360. 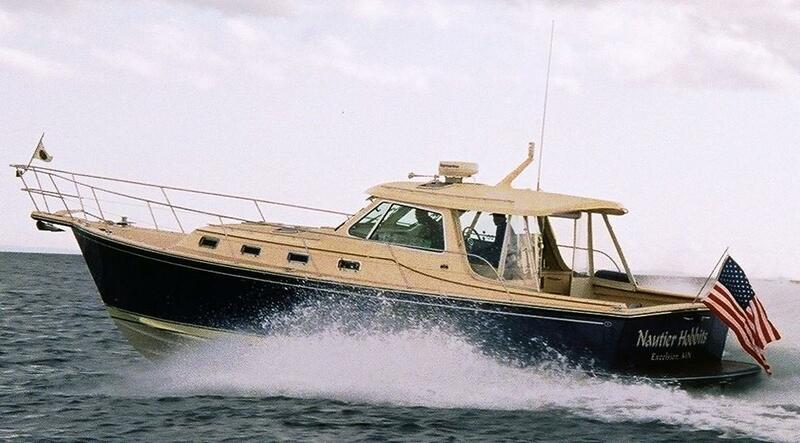 Nautier Hobbits is a fantastic Freshwater boat. She has had the best of care and is kept in Bristol condition by her loving owners. 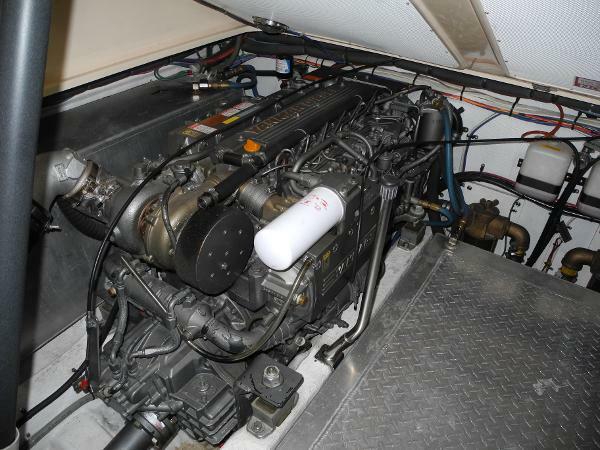 Stored in a climate controlled building more than 9 months every year, she has only 910 Hours on the Yanmar Diesels. 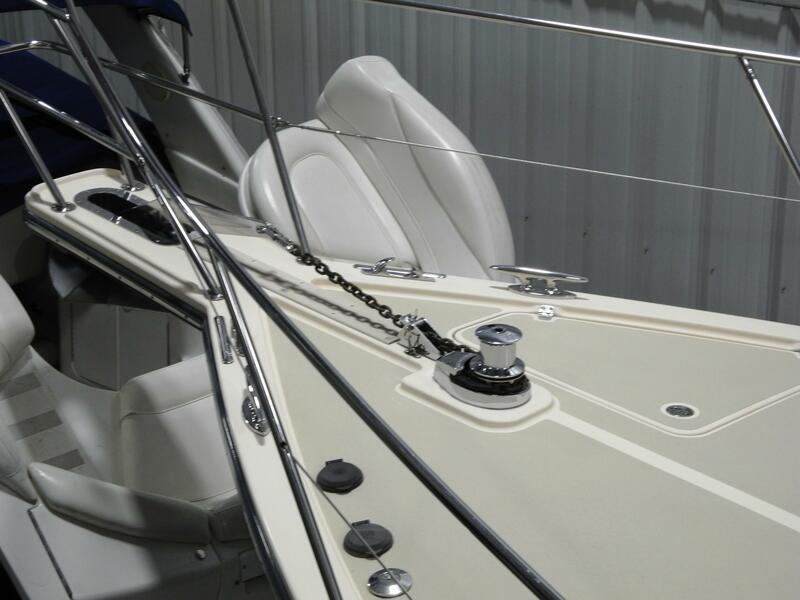 Numerous upgrades include a Freedom Lift Davit System. The 360's hull design has tunnels that reduce prop angle, providing a draft of only 2 feet, 8 inches. Tight turning at cruise speed produce a feeling similar to that of a smaller high-performance boat. This is a Super fun boat to operate. 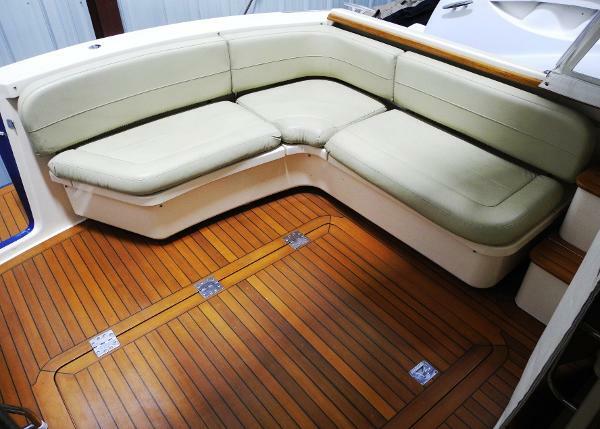 The bridge deck is well laid out for comfort, whether you're running or relaxing at anchor. 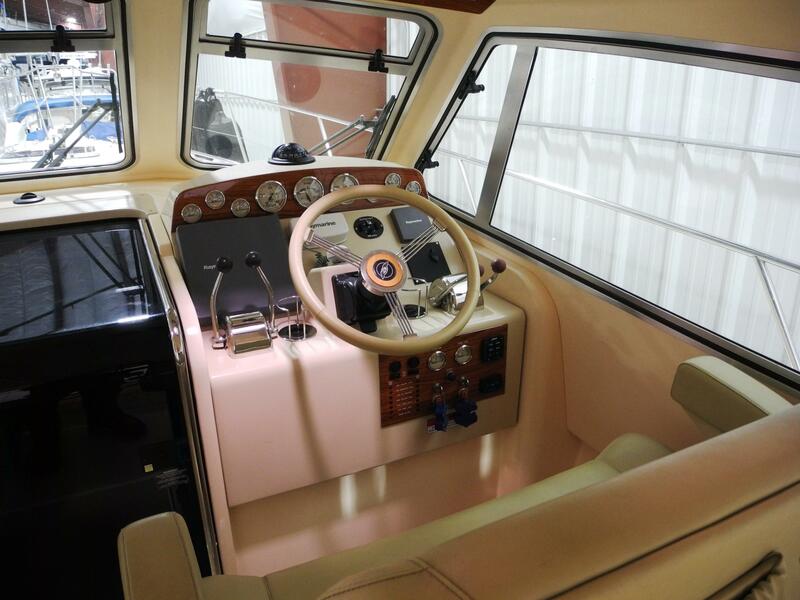 It has a fiberglass hardtop with two opening hatches. The three forward windows have opening vents on the top, as well as two opening side vent windows provide air flow on hot days. For comfort and visibility there is a fantastic 6 way adjustable double helm seat with arm and foot rests. The Dino leather-covered wheel, and the Faria instrumentation beautifully complement the durable synthetic wood-grain cluster. Controls are placed to allow an effortless reach while sitting or standing. The entire helm pod is hinged at its base to ease installation and service. There is a removable three piece drop curtain that can separate the bridge deck from the aft cockpit. Across, on the port side is an L-shaped settee with a varnished removable table and storage underneath. 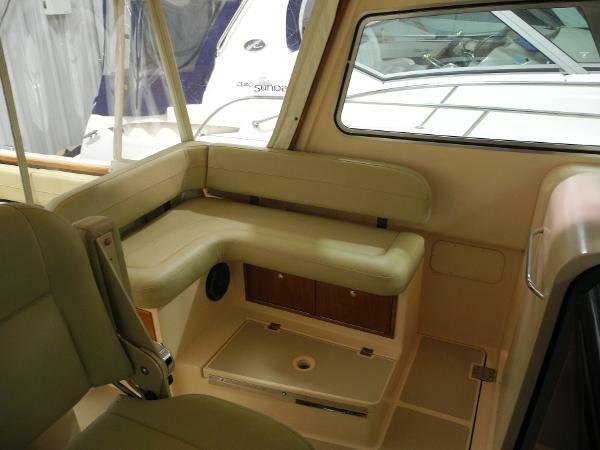 Behind the helm seat is a wet bar with a sink with hot and cold pressure water, plus additional storage areas. 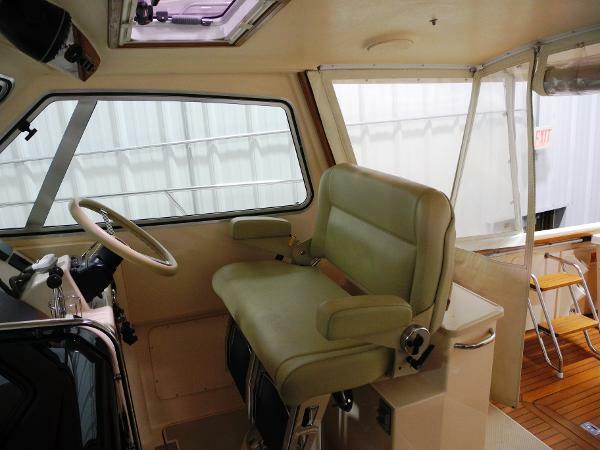 The aft cockpit has steps to the side decks and the optional L-settee with storage. 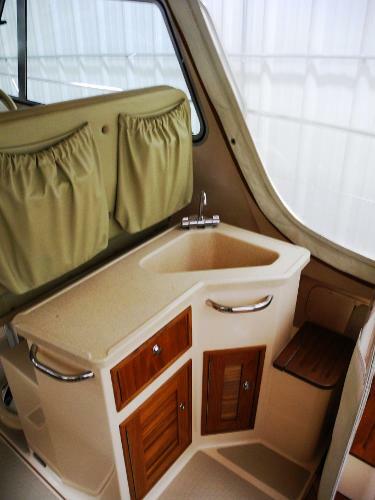 There is also a utility alcove with shore power connections, breakers, dockside water hook-up and a hot and cold cockpit shower. In the starboard aft corner is an inward opening transom door which goes to the swim platform. The heart of the mechanical systems are the dependable twin Yanmar Turbo Diesels rated at 370hp with only 910 hours. The engines are coupled to ZF Hurth transmissions for smooth operation. 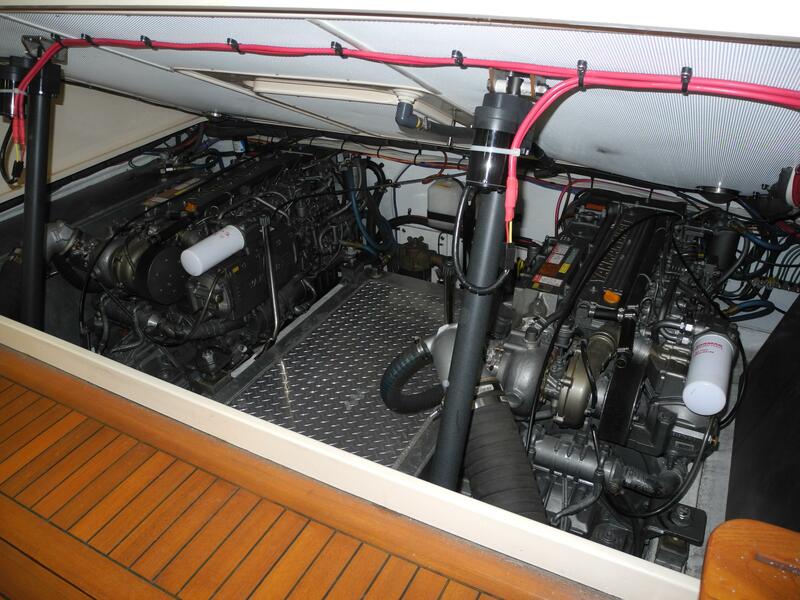 Access to the engines is provided by an electrically operated bridge deck or through the “dayhatch”. The boat has extensive sound and thermal insulation in the engine compartment and adjacent machinery spaces. The three welded marine aluminum fuel tanks operate as a single system which can be filled form either port or starboard. 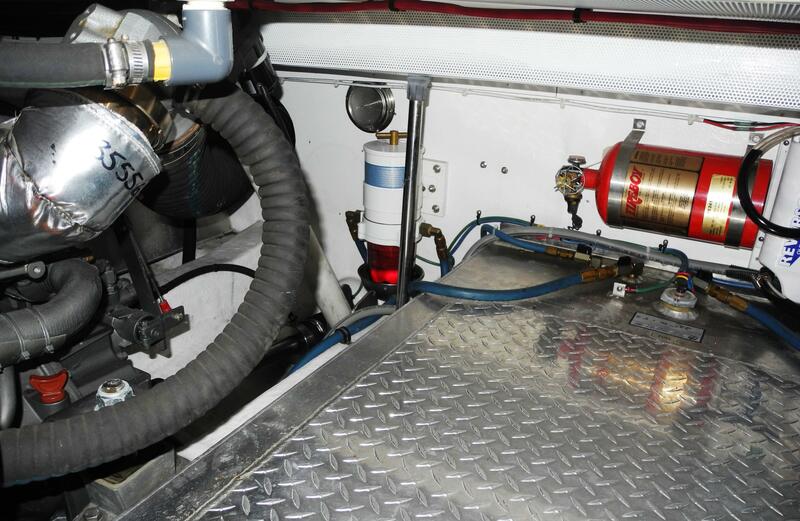 There are two 75-gallon saddle tanks and a 150-gallon centerline tank for a total of 300 gallons. For power away from the dock there is a Kohler 5kw generator with 250 hours on it. All the electrical wiring is marked for easy identification. 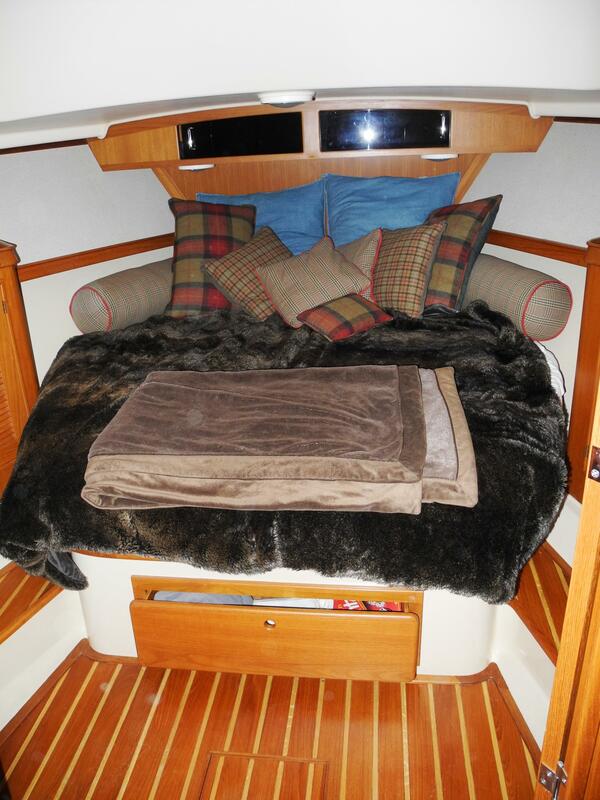 The Packet Craft has comfortable sleeping for 4. Two in the large forward cabin island berth. Two more in the main cabin. 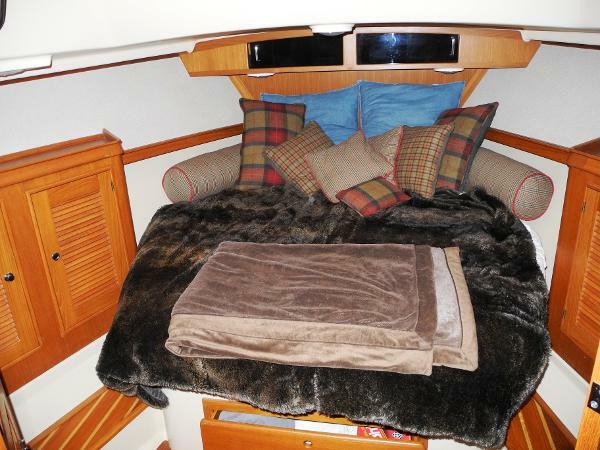 The L-shaped settee can be made into a double berth large enough to sleep 2 adults comfortably. Cedar lined drawers and lockers throughout provide generous storage. 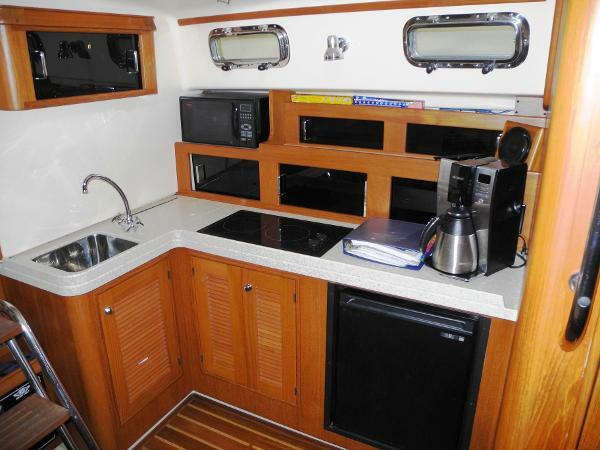 The fully optioned galley features Corian counter tops plus ample cabinetry and lockers for storage. The beautiful varnished teak salon table has an inlaid Island Packet logo and can easily be removed and conveniently stowed when not needed. The interior decor is a tasteful blend of premium designer fabrics and surfaces combined with a solid, bevel planked Teak and Holly sole. Lewmar hatches with shades and screens, paired with a sliding cabin door with a screen, provide multi-directional ventilation.